A cute and color-filled birthday balloon wishes for your loved one. "Everyone gifts chocolates and regular bouquets on birthdays. But how about this time, for your close one's special day, you give them a bright and colourful delight in the form of our exclusive balloon bouquet, with one large round Customised Bubble Birthday balloon as a centrepiece? 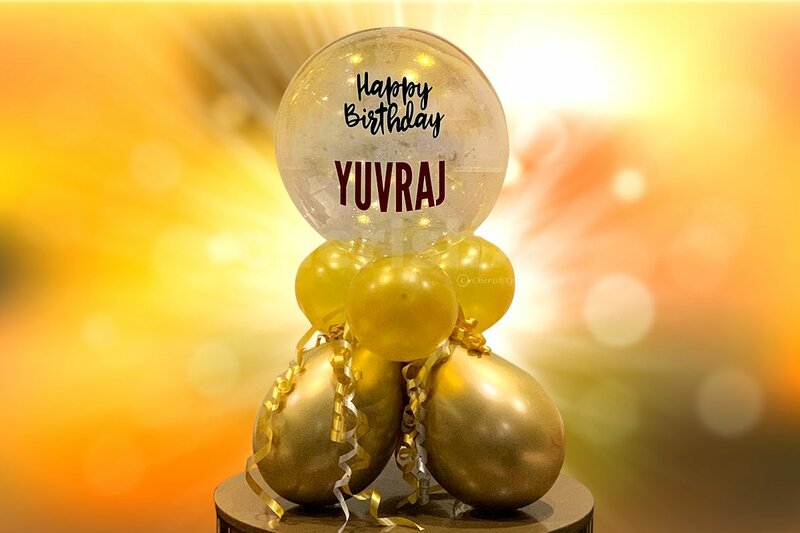 This exciting balloon is placed tightly upon a base consisting of Gold balloons (colours are customisable), making it all the more classy to look at! This balloon centrepiece is especially designed and crafted to be used as a decorative item and a gifting item as well. It is ideal for birthday parties, or just as a sweet way to wish someone a happy birthday. The entire arrangement comprises of 1 main Bubble Balloon with Customised Message, 3 Gold/Silver Chrome balloons & 4 Gold/Silver balloons. Whats more, we can deliver this exclusive bunch to an address or location of your choice anywhere in Delhi-NCR! Be a great gifter and go for this bouquet for your near and dear ones! "